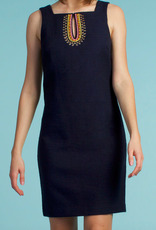 Bay Heights Dress in the Cotton Slub is perfect for the office or an upcoming event. It’s an A-line dress with colorful V-neck detailing. Wear a bold solid color shoe to add a pop of color.